Catalent Pharma Solutions recently announced that following the site’s 20th commercial product approval, it is investing nearly $14 million to expand biologics packaging capabilities and capacity at its Bloomington, IN, biologics manufacturing facility. Construction of the 15,000-sq-ft facility infrastructure, which will include five new packaging suites and a new quality control laboratory, is due to be completed in February 2019, with installation and commissioning of new equipment to be phased throughout the year. This will include a semi-automated and fully automated top loading cartoner, an accessorized combination syringe assembly machine, an automated auto-injector assembly machine, and two semi-automatic visual inspection machines. Catalent Biologics provides advanced technologies and tailored solutions for biologic and biosimilar development, from DNA to commercial supply, through our extensive Biologics network including: Madison, Wisconsin; Emeryville, California; Kansas City, Missouri; Morrisville, North Carolina, Bloomington, Indiana; and Brussels, Belgium. 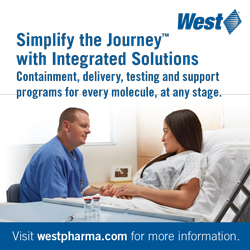 For more information on Catalent Biologics, visit www.catalentbiologics.com.